Fund-raising picnic dinner; recommended donation $20. Guest speaker: Olga I. Sanabria Dávila, Executive Secretary of the Committee for Puerto Rico at the United Nations, will speak on the subject of Puerto Rican independence. Directions: Take the Merritt to exit 36 for CT-106/Old Stamford Road, go north on 106 for 0.2 mile, turn left (west) at Jelliff Mill Road for 0.5 mile. It's on the left with lots of yard. Recommended donation $20 (click here for online donation). Celebrate the launch of the Planet Green channel at Greendrinks, June 4th, 5:30 p.m. at Pirate, 7 Wall St. in Norwalk. 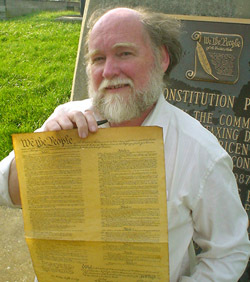 7:15 p.m. Richard Duffee will read from his poem, "The Slow News of Need" at Borders Bookshop on Rte. 7 in Wilton. 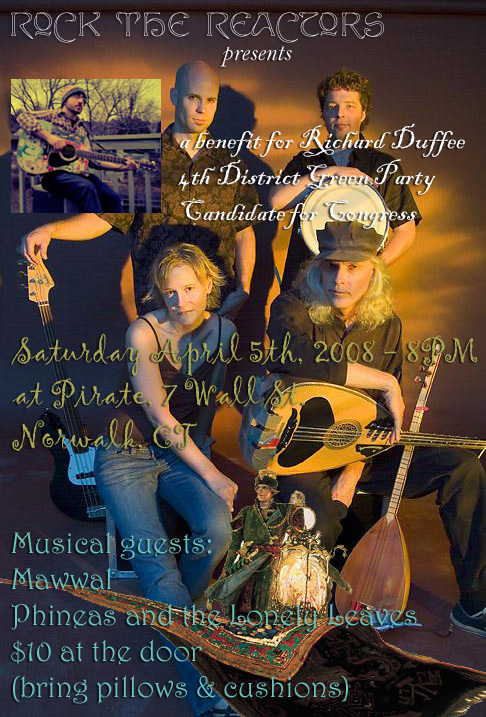 Join members of the 4th District Green Party during Chris Shays town meetings April 11, 12 & 13.
at Pirate, 7 Wall St.